Experiential learning or learning by experience is an approach that we at Swechha adopt in all of our teaching-learning programmes for schools. When we began working with schools on issues of environment and active citizenship, we realized the need to develop tools which break out of the monotony of textbooks and leave a strong impression on the students’ mind. In this way we developed and designed our exposure trips in Delhi and our travel-based learning programmes in rural India. Nothing drives home the need to reduce waste, as much as a walk inside a landfill. The sight of the mountain of waste, the stench of the garbage and coming face to face with people who work on this landfill make it difficult to ignore the problem. “My waste comes here? This is our waste?” are normally the first reactions that children have. “This is the Yamuna, before it enters Delhi” normally leads to surprise and joy at seeing a big span of clean water. “This is the Yamuna after Delhi’s drains begin to attack it” receives shocked silence at the sight of the black, frothing water. When children realize that the apathy and indifference of many has reduced the magnificent river to a drain, they begin to think and talk about the river. Invariably when they see people throwing garbage into the river, they yell and try to stop them, then and there. A walk through a forest or a biodiversity region helps children see and appreciate the interdependence of species which delicately weaves the fabric of life. What is the relationship between an ant and a snake? How does a butterfly help the flower? What role do dragonflies play? Are termites actually useful to us? Answers to many of these questions are found on such walks. Most of us know only as much of our cities as we choose to see. Children know or see only as much as they are allowed to see. Most often adults try to shield children from what we think is scary or dirty. To build sensitivity and awareness of people who live diametrically opposite lives than ours in the same city, children are taken on a night walk. The plight of the homeless and of daily wage labour, of services and sectors that work as we sleep, is eye-opening and often life-changing. A 12-day journey tracing the path of the river from its source to the plains is a journey of exploration and adventure. To see the pristine clear water, the reverence of the communities which live along the river and the importance of the river in every aspect of rural life, is a contrast from the abuse and neglect we see as we travel into the plains. The children listen to stories and legends, observe rituals and practices and learn about developmental and political issues related to the river. To live on campsites and in modest youth hostels or dharamshalas, without the everyday comforts of home, gadgets and junk food is also a challenge for the children. The beauty, the fun and the learning make it an unforgettable experience. A 4-day journey rafting on the most sacred and important river in India helps each child make his/her acquaintance with the Ganga. The poetry, the beauty and the rhythm of this magnificent river is inherent to this trip. Interacting with communities who depend on the river also helps children understand the other side of the debate for development and dams. This adventure trip helps children appreciate and understand this river and its problems. A 4-day camp in rural India for children from urban schools normally begins with defiance and denial. Will there be clean water? Will there be toilets? Will we be safe there? These are some of the questions we get at the orientation to the camp. 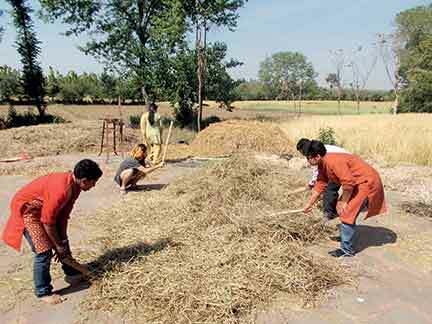 This reinforces the need for a camp to challenge and question notions and stereotypes that urban people have about rural India. The first two days are tough, but as the children manage to rise above their physical challenges, they begin to see the courage behind the poverty, the perseverance behind the hardships, the joy in the everyday and the imbalance in the development. Interactions with rural communities, a market study, cultural exchanges with local schools and simple living conditions help to achieve all this. The biggest learning from these trips is an appreciation of one’s own life along with a realization that we can live without gadgets and other luxuries and comforts. The subtle change in thought and approach emerges slowly as the children seem a little bit more sensitive, thoughtful and aware. In the last decade, we have conducted countless walks and yatras. Many of these children carry the experience and learning with them and return after a few years to volunteer or work with us, or tell us that they are pursuing a course of study influenced by the trip they took years ago. Every child, every perceptible change, every experience reinforces our belief that experiential learning of social and environmental issues is important not just to ensure better understanding of issues but to mould sensitive and empathetic leaders who have an accurate picture of reality and who will, when the opportunity beckons, make balanced decisions in politics, in business, in sports, in health and in education. The author is a teacher-educator who works with schools on issues of teaching and learning. She is Head of Programmes – Children and Active Citizenship at Swechha, an NGO which has created innovative learning programmes for children on issues of the environment, life skills and active citizenship. She can be reached at neha7779@gmail.com.